Instead of thinking about the snow (!!) we’re due to get tonight into tomorrow (March, you’re on my list too), I’m determined to think happy spring project thoughts. Ready to think spring with me?! 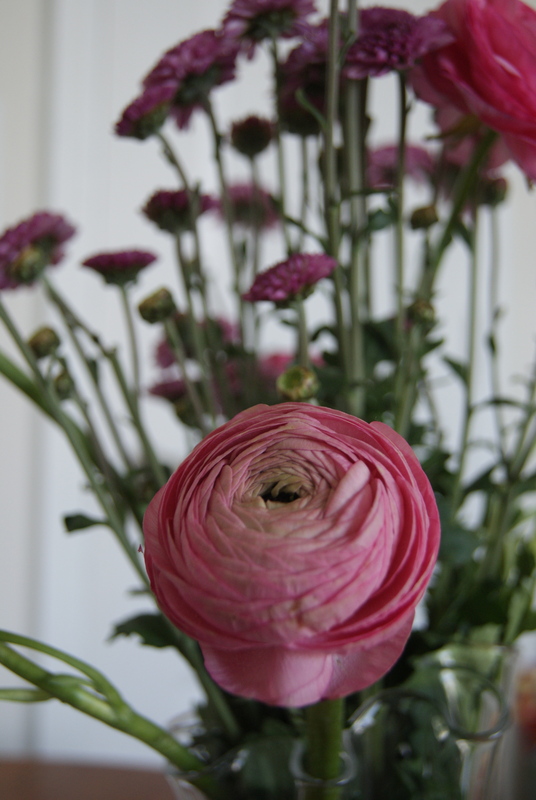 How funny it is that the ranunculus I bought on Friday outlasted the tea roses I also bought on Friday! Mums, of course, are cut-flower champs, but I’m so happy the pink ranunculus are hanging around. This yarn wants to become this sweater. It asked. Politely. Madelinetosh yarn, of course, from the March shipment of the Magnolia Society, which I joined in a moment of real snow-related weakness. It’s a new base, Tosh Mo Light (merino-mohair, I think), and the color is called Moth. 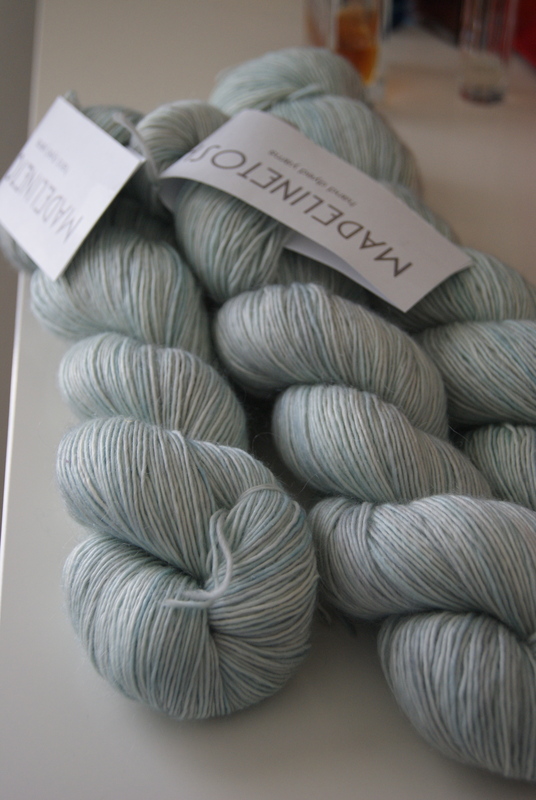 Perfect for a spring cardi. I may be overly ambitious, but my Holden shawlette is coming along so beautifully, and really, I could’ve made my February Lady Sweater work if I had been feeling more into it. I think I can cardi, ya’ll. Lucy and I have been reading this book obsessively for about three weeks. Here is a super-cute book trailer that is well worth one single minute of your still-brown March. I get choked up at the end when the whole world goes green. Every time. I also get a little teary reading “there are seeds and they are trying.” Oh my. I’m also thinking about how nervous improv piecing makes me, as I’ve got to do three big improv panels for the backing of Glam Garlands. 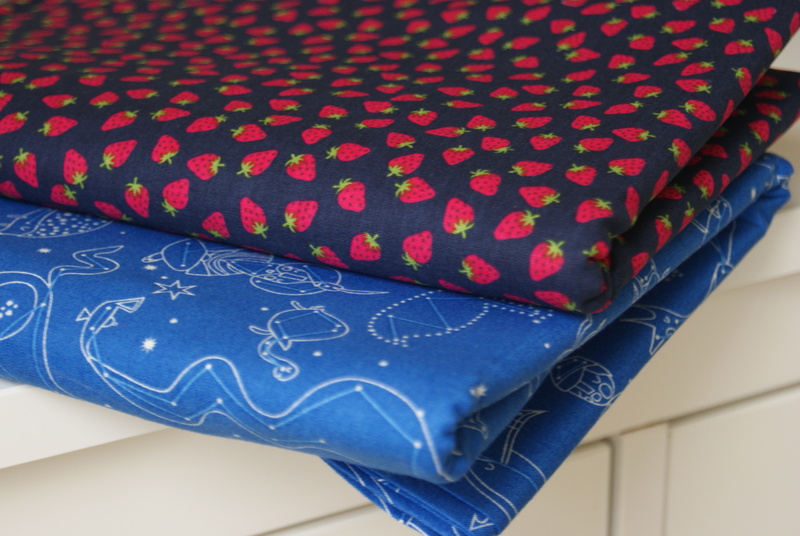 Terry cloth is also making me a little faint, and I’m really ready to take on a FMQ challenge for a little pillow cover. All coming this week! 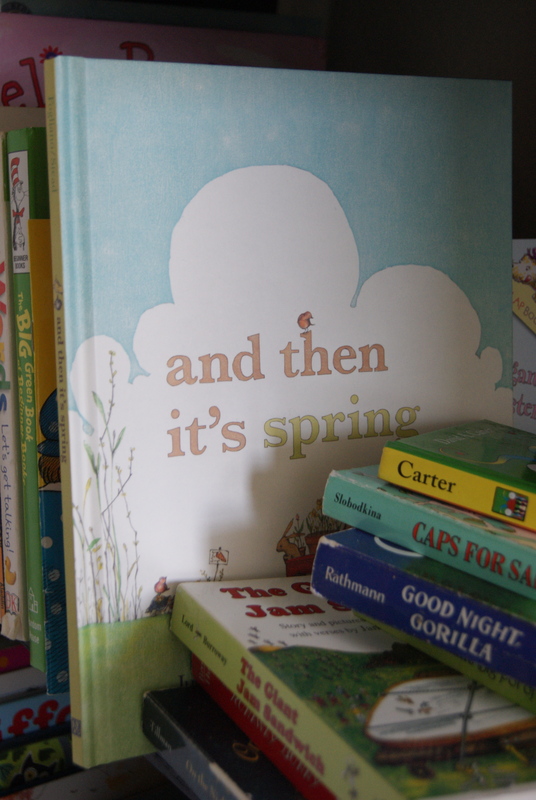 If we all think thoughts of spring, maybe it will come?! Good Monday to you all. I read, a little. (Or lots.) Did you know? 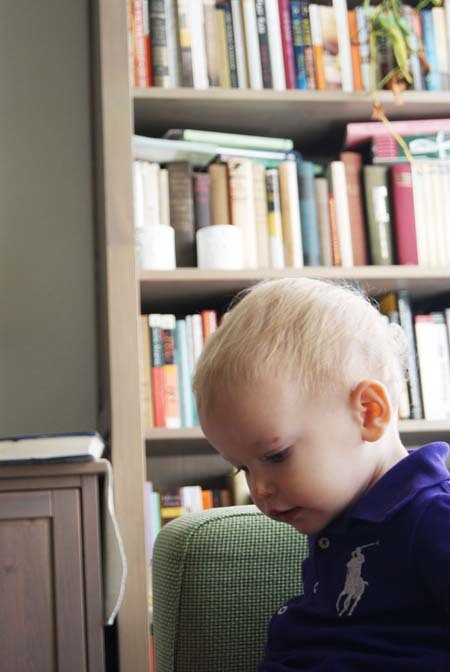 I find I haven’t checked the “books” box on this blog often enough lately. Probably because I haven’t felt particularly inspired by anything I’ve read lately. Oh sure, sure, there was Gone Girl and Marjorie Morningstar, both of which I sort of put off posting about while I chewed on what I felt about them, both separately and together. But last night I bit my husband’s head off because he disturbed me while I was trying to finish a book. The nerve! Could only mean one thing: I was deep into a really, really good one. 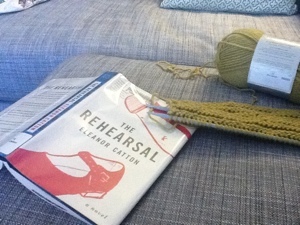 The Rehearsal, by Eleanor Catton, is the kind of book I wish I had the talent to write. It’s intimate, about women without being domestic (so rare and difficult to pull off! ), and is just slightly odd and off-kilter. At the heart of the plot is an affair between a male teacher and a 17-year-old female student. The book is fallout: people close to the affair, people far away from the affair, talking, writing, performing, reacting to what happened between Victoria and Mr. Saladin. The narrative shuttles between a saxophone teacher, whose students have been more or less touched by the affair, and an 18-year-old boy, a drama student across town. Both figures are guideposts for the other characters, while being pretty confused themselves about how they fit into their own lives. As the characters from the two spheres start to interact, the story both comes together and starts to unravel. I loved most the descriptions of female adolescence, of girls relating to other girls, to adults, to boys, and to men. Catton’s two years younger than I am (!!) and she seems to remember well what it’s like to grow up smart and observant in a sea of hormone-addled peers. Instead of skewing sentimental, as so much writing about girls does, Catton stays sharp, clean, and poised, and the book is unusual and refreshing for it. Also, it is brilliant. I find vacation reading very tricky. In general, I don’t enjoy stereotypical “beach reading.” I’ll never read Girl with the Dragon Tattoo, nor James Patterson, nor, probably, any of those Something Borrowed books. I’m embarrassed for Jennifer Weiner every time she postures and poses and tries to take on Jonathan Franzen. This is not to say that I want to take Jonathan Franzen on vacation! (I generally don’t enjoy Jonathan Franzen much more than Jennifer Weiner, truth to tell.) I get stuck between wanting to read something with substance, while also wanting to read something that will truly entertain me. One of my favorite feelings in the world is the feeling of being aggravated every time I have to put my book down and, you know, enjoy my vacation. As I mentioned yesterday, we just went South for a week’s vacation. So, of course, about four days before we left, all of my book holds came in allatonce. I had a huge pile of library books to finish before we got on the plane, because taking library books on vacation makes me feel squicky. I’ve been enjoying my prize, signed-by-the-author copy of Modern Patchwork for a week now. It lives on my pile of quilt inspiration books on the table in my bedroom, and it’s actually displaced Denyse Schmidt’s Modern Quilts, Traditional Inspiration in the top stack spot. That, my friends, is the highest kind of praise. Hartman’s blog, Oh, Fransson! 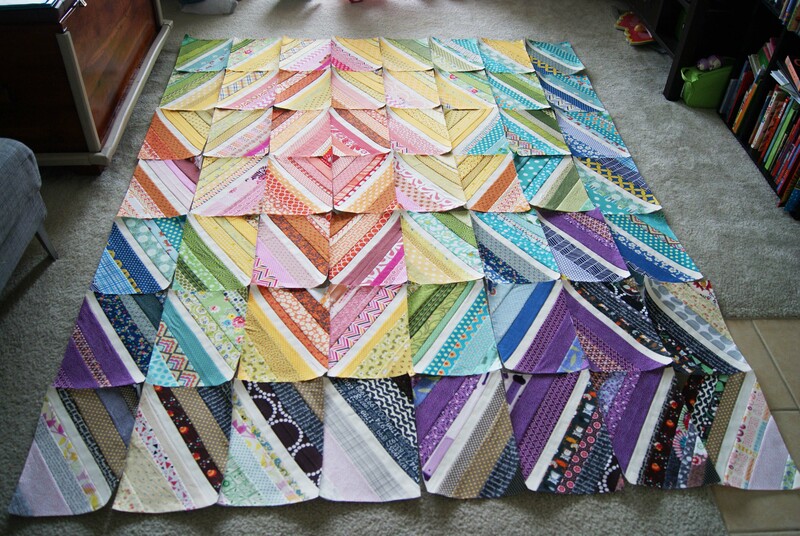 is one of my favorite quilt blogs. Hartman’s style is so different from my own. She’s a strict quilting modernist, with an occasionally whimsical representational side. (Her newest pattern, Refrigerator Magnets, is exactly what I mean.) I enjoy her style because it’s so refreshing to look at different things. I’d never dream of the quilt designs she comes up with, and her approach is very unique. Lots of quilters say they’re modern quilters, but rely on classic blocks made in modern fabrics to get where they’re going. Not Elizabeth Hartman. 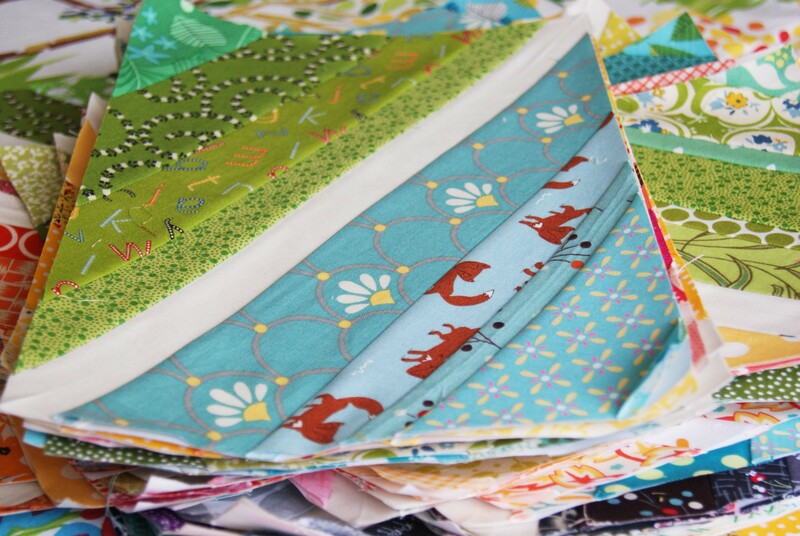 She’s absolutely unafraid to come up with new blocks, new designs, new ways to think about the quilt. This book, her second, is full of new quilts. My husband enjoyed paging through and picking out quilts he liked. He says they remind him of IQ tests, where you have to figure out the emerging pattern and guess which block comes next. He chose the most challenging quilt in the book–Escape Artist–as the one he’d like most to have. I promised I’d at least consider making a queen-sized version for our putative new bed in our putative new home this winter fingerscrossed. Even though this quilt looks terribly challenging, Hartman’s written some beautifully detailed instructions and diagrams, and I feel like I can just about get my mind around the project with her help. I also think Hartman is great at helping quilters with the basics without seeming condescending. This book is meant as a next step for intermediate quilters, quilters who feel they’ve conquered the basics of patchwork and are ready for some challenge quilts. And then there’s me: I live for a quilt challenge, but don’t really have all my basics down, because I am so self-taught. Hartman’s helpfully included sections on basic techniques (pinning! I’ve already changed the way I pin my blocks at her suggestion, and oh my gosh what a difference) and fabric choices, illuminating some of the aspects of quilting I find most difficult. 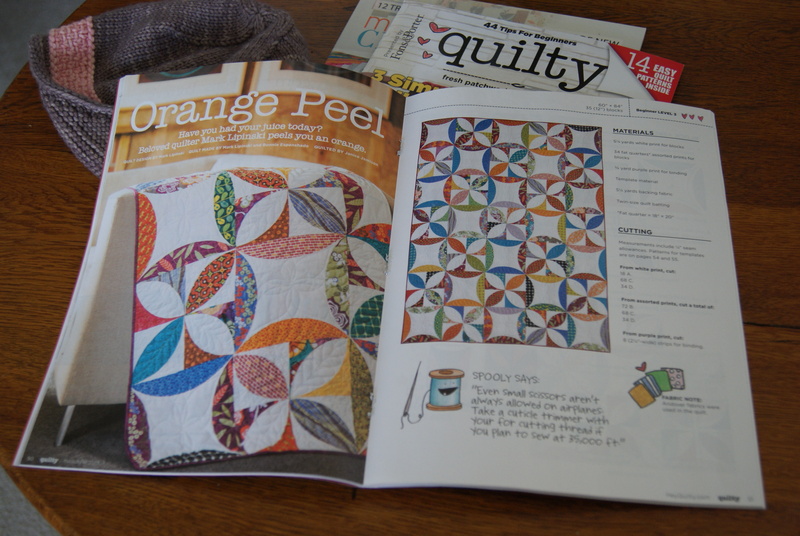 In short I’d recommend this book, even to a beginning quilter, because it’s a fresh, new look at quilting. 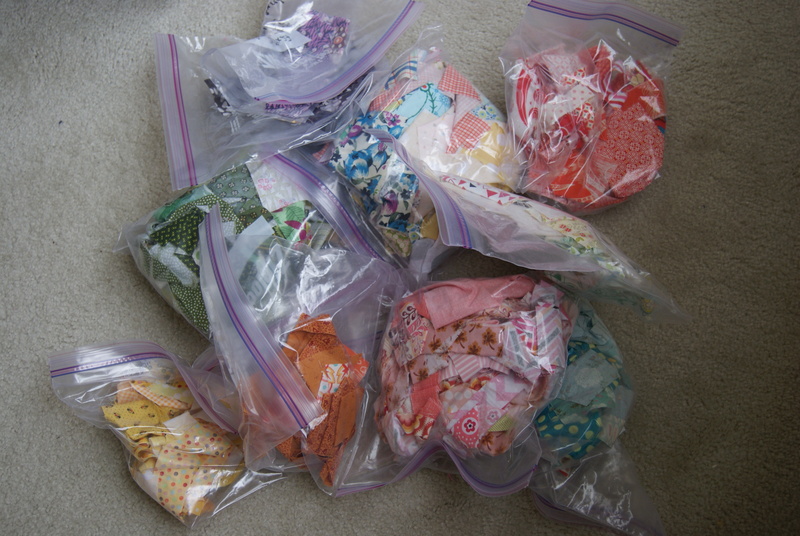 Hartman’s pushed the boundaries of modern quilting past their simple beginnings (please, please, no more wonky log cabins), and I feel much more ready to take on my first real “modern” quilting project with her guidance. Bink and Gollie by Kate DiCamillo (yes, of Despereaux fame), Alison McGhee, and Tony Fucile was our FAVORITE picture book of 2010. Nathan loves the comic-like structure of the books, and the way that the pictures are often allowed to narrate the action. I love that Bink and Gollie are ordinary girls. They aren’t princesses. Or superheroes. Or even pigs with long ears, big mouths, and impressive wardrobes. They’re just girls, and they’re just best friends. 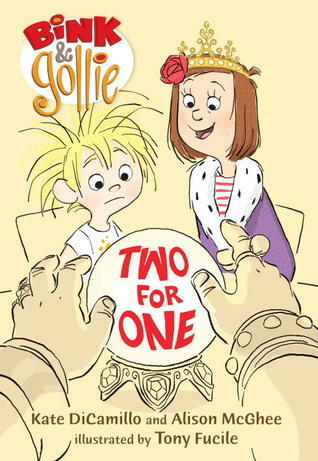 So when a friend who works at Candlewick Press scammed Lucy an ARC of the sequel, Bink and Gollie: Two for One, I squealed a little, fawned a lot, and thanked profusely. (And then, like a nut, I pre-ordered the hardback because, seriously, the ARC is not going to stand up to the kind of wear it’ll get around here.) Two for One pubbed yesterday, and it’s well worth $15.99 of your children’s-book budget. Bink, a short, round, blonde ball of energy, and her best friend, brunette, well-spoken, slim Gollie, go to the state fair. There, they lose at Whack-a-Duck (though, boy, that carny running the game gets the worst of it), work through a mild case of stage fright, and have their fortunes told. As in the first book, it’s not the situations themselves that make this book charming, though there’s plenty of cheap physical humor for easy laughs. Not only are Bink and Gollie ordinary girl characters, but they have an ordinary little-girl best-friendship. Their friendship isn’t without its hiccups (“It’s a compromise bonanza!” Bink declares in the first book), but it’s a stronger friendship for those hiccups. When Bink beans the carny, Gollie’s there to support her. When Gollie opens and closes her mouth like a fish instead of bursting forth with talent at the amateur talent show, Bink drags her out of there to an impromptu, audience-of-one talent show in a neighboring barn. Naturally, when the girls have their fortunes told, their futures are, “without question,” intertwined. It’s hard work to raise a little girl. It’s even harder work to raise one who’s not some kind of princess-pink-vomiting Gossip Girl-Mean Girl drone. Lucy’s a little young yet for Bink and Gollie, but it’s the kind of book I’ll keep reading to her and putting in her hands as she grows. Ordinary girls deserve good friendships, good role models, and good books. Bink and Gollie: Two for One is one of the good ones. Look at those goodies! Elizabeth Hartman of Oh, Fransson! 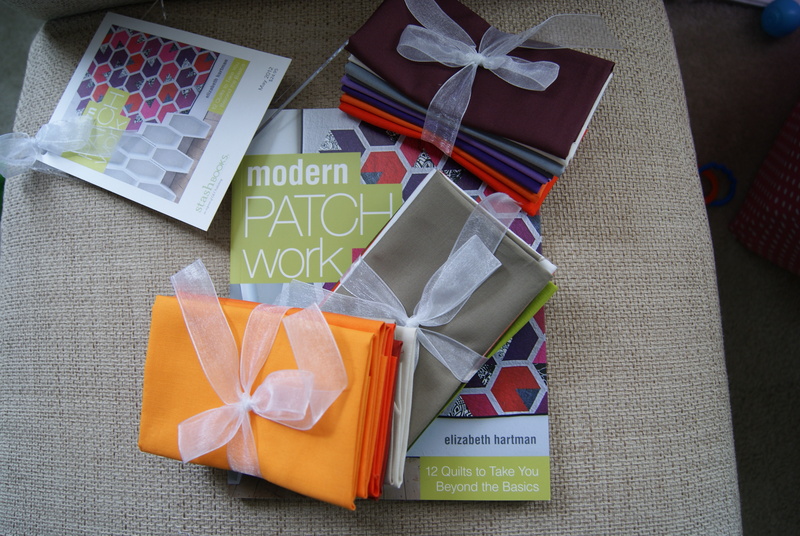 held a series of giveaways a couple of weeks ago to celebrate the release of her new book Modern Patchwork. I’d had her new book on my Amazon wishlist for months, but was lucky to win a giveaway copy, plus three little fat eighth Kona solid bundles AND (total awesome bonus win) thick high-quality plastic templates for making Hartman’s Fire Drill quilt. The thick templates come from Tabslot, and though I haven’t worked with them yet, they are so thick and durable that I can tell template cutting won’t be the nightmare chore it usually is. 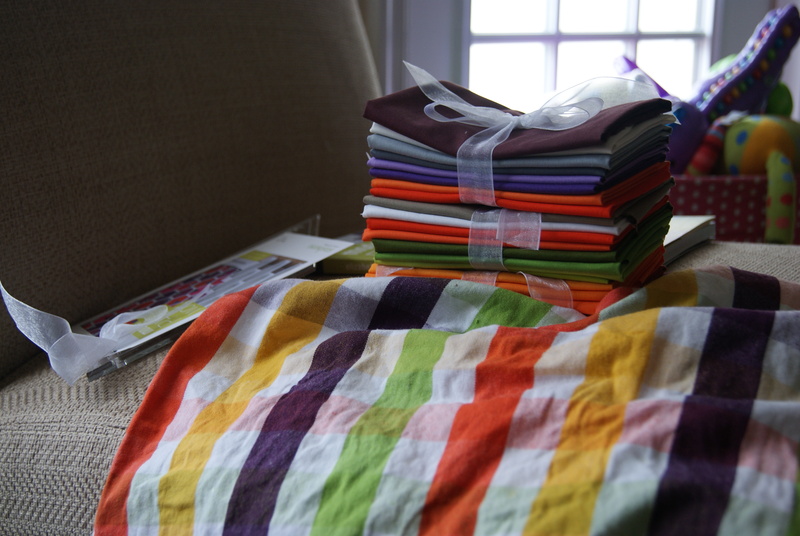 BWA HA the colors all “go” with my purple-lime-yellow-orange Crate and Barrel kitchen towels that I love love. 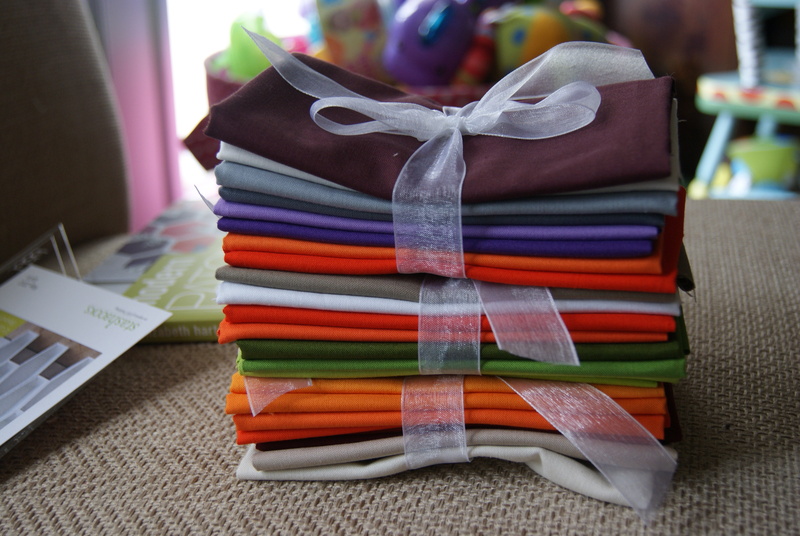 Maybe it’s time for some ric rack napkins? Or a new sofa quilt (so that we can stop putting so much wear on our current sofa throw, which is the one and only quilt of my Granny’s that I own)? Or, perhaps most tempting, some new throw pillows in big bold solid triangles?